You must read the following information, share it with your staff, and review the provided directional, parking, and festival maps. LOCATION: Agri-Nature Center, Village of Los Ranchos. IMPORTANT – DO NOT TAKE MONTANO – as it does not connect with Rio Grande. Take Candelaria or Griegos for the nearest cross streets. MAPS for Arrival & Parking Instructions. Friday, July 6: 9AM – 6PM. You MAY drive close to your booths/tents on Friday. This requires driving on an active farming field. We are not responsible for vehicle damage. TENTED VENDORS: Upon arrival, do NOT remove the sidewalls of your tents. We will provide you with zip ties so you may close your own sidewalls when you leave. All booths and tents will be secured and monitored by overnight security. You WILL NOT be permitted to drive a vehicle onto the field or near your space on Saturday. 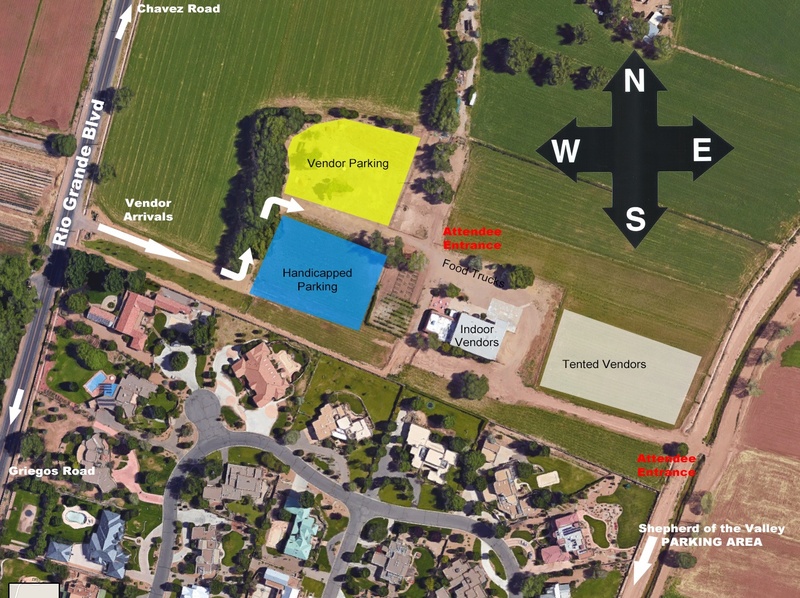 All vendors are permitted ONE ON-SITE VEHICLE – see parking information below. You will be required to transport all of your merchandise, decor, and supplies BY HAND from the vendor parking lot. Bring a dolly or wagon or means to transport materials from your vehicle to your booth. We have very limited onsite parking and we apologize ahead of time for the inconveniences and appreciate everyone’s understanding and patience. All vendors are provided with ONE on-site parking spot. More vehicles may pull up to unload materials but only one vehicle may park on-site. We will have golf carts to shuttle staff to the event site starting at 8:00AM. ATTENDANCE: We expect over 8000 attendees during the day. Please be prepared with cash change. 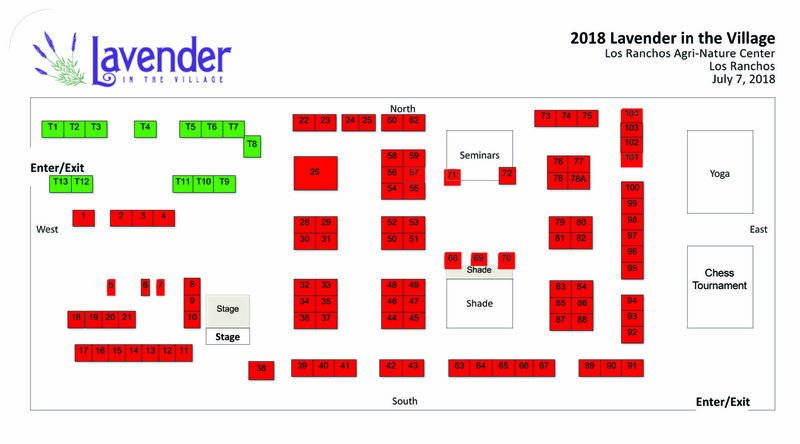 Non-mobile vendors will be provided with one 8’ table and two folding chairs for your booth. Bring your own table covers. Vendor badges will not be required at this event. There will be ice vendor located next to the music stage throughout the event. They are 8lb bags and cost approximately $1.75 each. There will be two ATMs on site, located by each of the entry points. Alcohol vendors are required to ID every customer, for every purchase. Wristbands are not being issued for the event. We will have two dumpsters onsite: One for general trash and one for Recycling. Vendors are responsible for getting ALL of their trash to the dumpsters after the festival. During the event, if your own in-booth trash fills up, you may empty it into one of the large trash bins located throughout the event. There is no WIFI available at the facility. If you ordered electricity, you must bring with you no less than 100 FEET of grounded (3 prong) extension cord(s) and power strips. Cords must be in good condition. The fire marshal will disconnect any cords that are frayed or taped together or pose a fire risk. Only those who have ordered and paid for electricity ahead of time are allowed to utilize electricity. All vendors booths must remain open until the end of the festival which is at 5:00PM. Do not break down or load out your booth prior to 5PM. While we are anticipating perfect weather for this event please bring a tarp or plastic cover that you could utilize to cover your products and decor should the necessity arise. If rain or winds pick-up, please listen for announcements.